Our presenter Michael Jemison, Managing Director for MacVine, was a man who enjoyed telling great stories about his travels through the houses of champagne, particularly Michael’s favorite, Champagne Dumangin, whom de gorge the champagne on order, not in bulk. 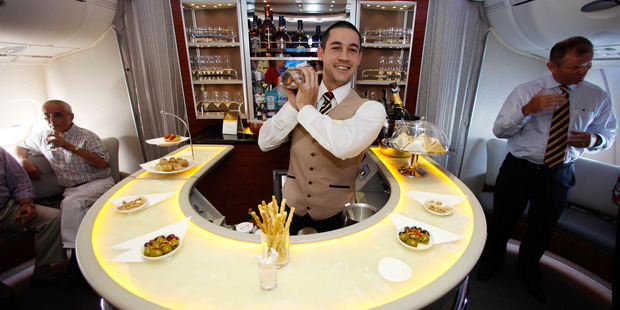 Michael is well rehearsed in the art of conversation and spoke about each wine passionately and with great enthusiasm. The Prosecco was Extra Dry meaning not sweet. Ah, Italians and their use of English, just love it. Being a vintage wine, 2013, I was expecting more. The Yerring Station Yarrabank Cuvee was beautifully made – simple and elegantly made with friends from Champagne Devaux – 15/20. From Burgundy, the Andre Delorme Terroir d’Exception Blanc de Blanc was bottle fermented in the champagne style with lovely yeasty extract and a gentle sweetness giving way to slight acidic undertone, very refreshing. Right up there with our methode champenoise – 16/20. The 2013 Kerpen Riesling Kabinett has a hint of flinty minerality and earthiness on the nose. The initial hit of sweetness while not overpowering gave way to soft acidity which balanced well with food. For me, this wine was the star of the show – 18/20. Dumangin Rosé and 2003 champagnes were both subtle in flavour with beautiful nose characters of yeast, apricot and lemon rind. A short finish left me expecting more – 16/20. The wines overall were of quality befitting any Christmas lunch but several I’d want to keep to myself and drink in a quiet space to savor their complexities. If you do see any of these on wine lists, worth a try. 2013 Italian Prosecco – Ca Di Rajo Prosecco Superiore Valdobbiadene DOCG Millesimato Extra Dry – Actually bottle fermented and from the best region in Prosecco. It’s an off-dry style even though its say extra dry which in Italian mean off dry. Australian bubbly – Yerring Station Yarrabank Cuvee – Made with the help of a French Champagne house so offers a point of difference quite smart. French bubbly – Andre Delorme Terroir d’Exception Blanc de Blanc NV – From Burgundy hand is made the same way as Champagne last year would best sparkling wine in Cuisine Magazine. 2003 Dumangin Premier Cru Vintage Champagne – 95 points Bob Campbell this is rich like Christmas cake and complex. We’re getting ready for a busy season with Nov bubbles and Dec dinner. While numbers were a bit low for this tasting it was never the less a very enjoyable evening. A supper was arranged for the evening and it was thought that this went well and had a good balance of items with the shortbread with champagne concept working well. 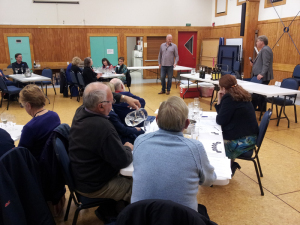 The presentation had a good balance between John and Mac with lovely wines presented. While this was a good evening for those who attended, the committee is conscious that the venue and types of wines presented may be possible causes for the lower than expected turnout. We will be seeking feedback from members about suggested formats for the festive evening at the next AGM – asking what do the club want e.g. higher priced wine versus more affordable wines. Also we have used Advintage for three years now and it might be time for a change. We will be looking at alternative options for presenters, albeit we have had excellent support from Mac and Advintage. Bubbles/Champagne; Bubbles by Lobetia, Squawking Magpie SQM Blanc de Blanc Brut, Champagne H.Garnier and Co. Brut NV, and Roederer Vintage 2006/07. 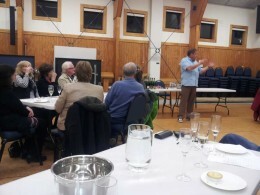 See the Blush, bubbles & stickies – Nov 2014 tasting review. The club would very much like to thank Advintage for their regular participation and generosity at our November tastings over recent years. We would love it if members were able to place orders to make it worthwhile for Mac to make this annual trip to Wellington. Click image to view more images in the gallery. Mac and JK’s roadshow was even better than the last two years. The tasting started with a quaffer Bubbles by Lobetia, a refreshing low-priced bubbles with citrus flavours – surprisingly good. One of the most popular items sold by Advintage is Champagne H.Garnier and Co. Brut NV and Advintage are the only New Zealand provider of this finely beaded tipple with apple and yeasty notes from the wooded chardonnay – very smooth. We finished the first half of the show with the 2007 Vintage Roederer. Subtle woodiness reinforced lightly toasty and vanilla flavours with a superb rich finish. As Mac says, ‘pay that little bit more and you’ll get that increase in quality you’d expect’ especially when comparing bubbly. After a great supper we got into the rosé and sweet wines. As Mac says, ‘very cool, different options and exciting flavours’. The 2014 Rockburn Stolen Kiss Pinot Noir Rosé was just as first remembered it back in 2010, candy-floss aromas with crème-brûlée and strawberry flavours. The committee provided Christmas pies and biscotti to go with the showstoppers, Buller Fine Old Muscat and Valdespino Pedro Ximenez El Candado. The muscat, oh what a revelation, raisin notes with a rich intense molasses finish. This is truly a drink for anyone, even beer drinkers would appreciate the fine quality at an affordable price. One last note. “After a brief hiatus, ‘JK’ has returned to his first love with a vibrant range of Hawkes Bay varietals. John has always made wines ‘with a big bunch of flavour ‘, and much like the man himself, these are generous, outgoing wines – full of character and colour.” – Go to Advintage for Big Bunch Chardonnay, Pinot Gris and Sauvignon Blanc. Thanks to Mac, JK and all the team at Advintage. John (Mac) Macpherson from Advintage presented for the second year in a row. A change of format in that we are going away from the strictly bubbly theme of previous Novembers, however sticking to the festive theme. Mac was accompanied by John Kemble again which proved to be a lively night. Look at the line-up. There was something for everyone here. Charge: Members $10 Guests $12 – Numbers are limited so please reply to Robin’s Cellar Club Newsletter & email. accompanied by John Kemble again so be prepared for an entertaining night. Look at the line-up. There is something for everyone here. Veuve d’Argent Methode Brut NV – Not from Champagne but produced by the team at Louis Bouillot in Burgundy. This sharply priced French Methode is delightfully fresh, well balanced and deliciously loaded with fresh apple and stone fruit characters. Lake Chalice Pinot Rose 2013 – Advintage say that this it is clearly one of this vintage’s best Roses. Fresh and deliciously off dry with lingering strawberry and tangy citrus flavours. Te Whare Ra Toru – A blend of Gewurztraminer, Riesling and Pinot Gris. The previous vintage took out a prestigious TOP 5, FIVE STAR & BEST BUY spot in Cuisine Magazine. Squawking Magpie The Stolen Chalice Reserve Chardonnay 2012 – Notes not currently available. Chapoutier Cotes du Rhone 2012 – A Grenache/Syrah blend; In Advintage’s opinion Michel Chapoutier dominates the Cotes du Rhone market in the lower price French range and this glorious 2012 is, quite simply, extra-extraordinary value. Two Gates Syrah 2011 –. Two Gates is a premium, organic focussed, brand from the proven Rod McDonald stable. Grown from fruit sourced from the original Two Gates vineyards, this is a superior Hawkes Bay Syrah that is built for the long haul. Champagne Lanvin Brut NV – Notes not currently available, but a well-known Champagne. Champagne Taittinger Brut NV – Taittinger is heralded worldwide as a Champagne of great finesse, elegance and understated power. 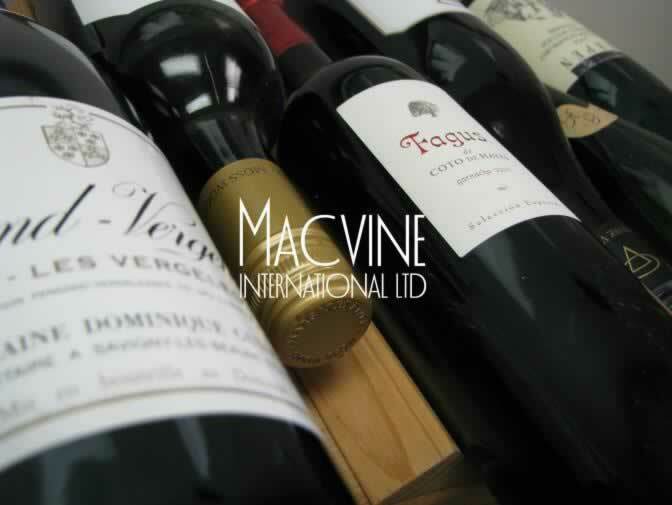 The Club is indebted to Mac for his generosity in providing many of the wines without cost to us. Many of you know John Macpherson and Advintage. Few members have not purchased a bottle or two from this outlet. The following is a hint of what we might taste. There could be a couple of changes but the general theme will follow this outline. The links are to the Advintage website and provide detail of the proposed wines. John Kemble of Kemblefield wines along with Mac will present a winemaker’s perspective in parallel to a distributor’s perspective. A light supper will be provided so be in for this tasting, and I’m sure it’s one tasting you won’t want to miss it. When you’re a wine store based in the sleepy but ever-so-slightly pretentious Hawkes Bay village of Havelock North (pop. 10,000) and you ship thousands of cases of wine nationwide each month, you must be doing something right. Right? Read the rest for yourselves. This promises to be one of those rare nights you will talk about to your friends and other members for years. You will need to book for this tasting. If you haven’t done so, do it now. Let Robin know by contacting him at semmens@xtra.co.nz. Thank you everyone for sending in your responses for this month’s bubbles tasting and the dinner in December. We have closed the numbers for this week’s tasting and all that remains is for you all to come along and enjoy yourselves. There are still a couple of spots left for the Dinner if you wish to come or bring some guests. But you need to let me know ASAP. Start time is 7:40pm for an 8pm start. 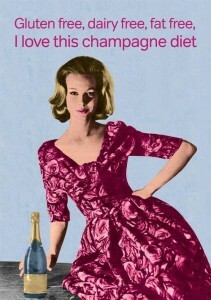 Recent research from the University of Reading has found champagne has the same health benefits as found in red wine. 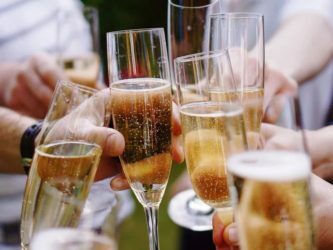 Champagne contains polyphenol antioxidants, which are believed to reduce the effects of cell damaging free radicals in the body. In particular, these antioxidants slow down the removal of nitric oxide from the blood, lowering blood pressure and therefore reducing the risk of heart disease and stroke. Also check out How to gift wrap a champagne bottle.